John W. Stone was born in Wadsworth, Ohio, on July 18, 1838, and was of English descent. He was educated in the public schools of Ohio, and at the academy in Spencer. In 1856, his family moved from Ohio to Michigan and settled on a farm in Allegan County. At 22, while he was still laboring on his father’s farm, he was elected County Clerk. While serving in that office, he studied law and was admitted to the Bar in 1862. At the expiration of his term as County Clerk, he was elected Prosecuting Attorney, and was twice re-elected to that office. In 1873, he was called to the high office of Circuit Judge of the Allegan Circuit. He resigned from this office after only a short period of service, preferring to enter into the private practice of his profession. He became a partner in the newly renamed firm of Norris, Blair & Stone. From 1876 to 1880 he served as a member of the United States Congress. Declining re-election to Congress, he entered into the general practice of law in Grand Rapids, and was in that same year (1880) appointed by President Chester Arthur the District Attorney for the Western District of Michigan. In 1890, though a resident of another Circuit, the people of the Twenty-Fifth Judicial Circuit persuaded him to serve on their Court. 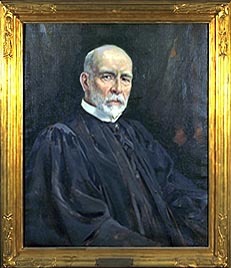 He served in that office continuously until 1909, when he was elected to the Michigan Supreme Court.